Scott Janssen rubs a bruised arm while wearing a boot for his broken foot on March 5. When he opened his eyes, his sled mangled, his head throbbing, Scott Janssen awoke to find his dogs huddled around him. There was Queen, the eldest at age 6. There was Moegli, the youngest, only 18 months old. His full team of faithful, yelping charges was there, eagerly awaiting their musher’s next command. Janssen, 52, is known as the “Mushing Mortician’’ in and around Anchorage, where he runs a successful, funeral home business. He has now entered the legendary Iditarod Trail Sled Dog Race four times, including in 2012 when one of his dogs suffered cardiac arrest on the trail and was revived when an alert Janssen applied heart massage and mouth-to-snout resuscitation. This year’s Iditarod, which could see its first musher cross the finish line in Nome on Monday, ended after only a couple of days for Janssen, soon after he reluctantly triggered the “SOS’’ button on the GPS device that only this year became mandatory for sledders. Ultimately it was one of Janssen’s dogs, Hooper, who greased the skids for his exit from this year’s race. On a particularly tricky part of the course, Janssen loosened the neck lines on Hooper and a few of the other dogs in order to keep them from being injured. Well, the slackened line was Hooper’s invitation to do some sightseeing, by himself, which in turn forced Janssen to recover Hooper. This is where the 2014 Iditarod turned into Janssen’s wilderness version of the “Out-of-Towners’’, the 1970 Neil Simon film that starred Jack Lemmon and Sandy Dennis as George and Gwen Kellerman. The Kellermans, visiting New York City from Twin Oaks, Ohio, found nothing but trouble in Manhattan. During their brief visit, they were mugged (twice), kidnapped, blasted by an exploding manhole cover, attacked by protestors in front of the Cuban Embassy. There are no manholes in wilderness Alaska, but there’s plenty of ice at this time of year. In pursuit of the miscreant Hooper, the 5-foot-6-inch, 178-pound, previously-concussed Janssen slipped while dashing across an icy creek. His Kellerman moment. 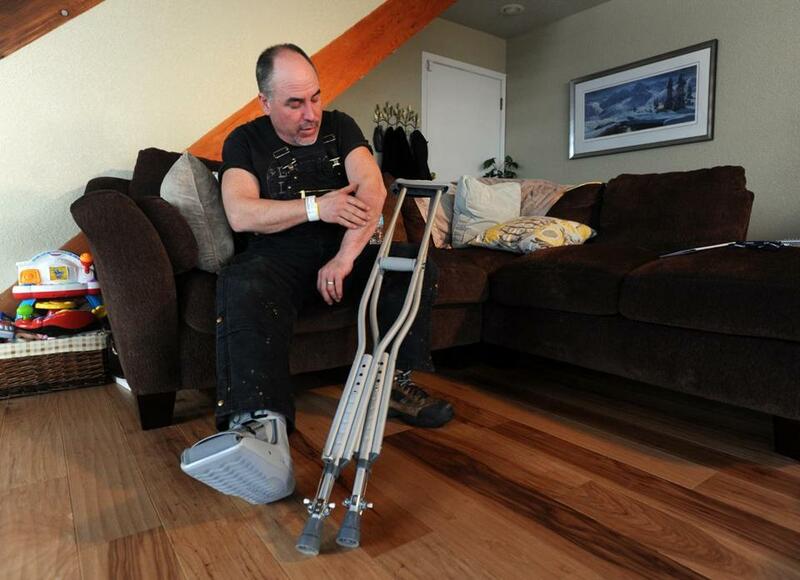 Upon his crash landing, he cracked a bone in his right foot, sending pain searing up his leg. Worse (if that’s possible), his fall smashed the ice, sending chilled water rapidly filling into boots and soaking his outerwear. To add a touch of comedy to rival Simon’s script, amid it all Hooper returned dutifully to the rest of the pack and was ready to resume what was left of the 1,000-mile haul. But Janssen, sprawled in the creek, was finished. He figured he might have coped with the pain, but the soaked gear in that bonechilling cold left him with no option other than the SOS button. The bit of fortune in it all was that another musher, Newton Marshall, a Jamaican, pulled over to help Janssen straighten up and prepare for the rescue helicopter. It took the Alaska Air National Guard rescue helicopter and an in-flight assist from a C-130 refueling tanker to whisk the hobbled, addled, chilled Janssen back to Providence Hospital in Anchorage. He was admitted with the foot fracture, concussion, and a core body temperature, he said, of 76 degrees. Rescuers gathered up Janssen’s dogs and by late last week the pack was on a reunion flight back to Anchorage. The proud owner recited the passenger manifest as he awaited their arrival: Beatrice, Jack (lead dog), Murray, Eagle, Queen, Cutie Pie, Cosmo, Moegli, Iceman, Spot (of course), Hooper (Janssen: “He’s nuts!’’), Toby, Possum, Rocky, Poseidon, and Raja. Janssen intends Sunday to be on a flight out of Anchorage, headed to Nome. By late last week, only 56 of the 69 starters were still in the race. He wants to stand at the finish to see his friends, root them in, all of them winners.